Students from the T.C. Hamlin School in Randolph will move to the Pittston Consolidated School next fall after the local school board voted to close the Hamlin school earlier this year. As Maine’s population has grown older, the number of school-aged children has declined, forcing some communities to close schools that have been social anchors for years. One recent school closure may serve to reflect the challenges faced by Maine’s rural communities. It was a bittersweet day last month at the Pittston Consolidated School, south of Gardiner. The elementary students there were joined by about 40 kids from nearby Teresa C. Hamlin Elementary in Randolph, only a few miles away. They had come to take part in a carnival event, competing in relay races and squirting water guns. It was the first time that students from Hamlin and Pittston came together like that, but it won’t be the last. 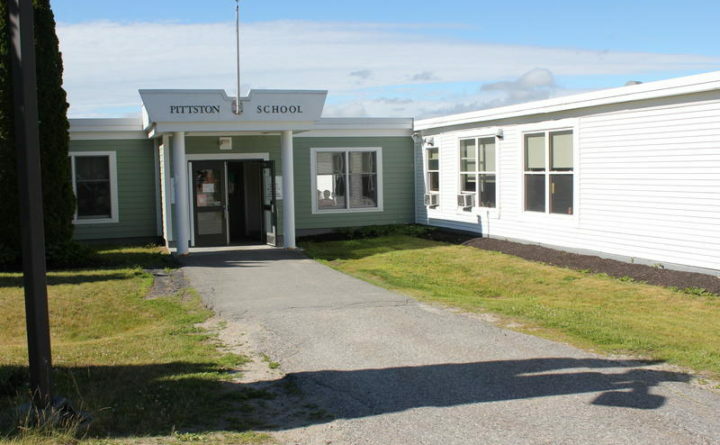 In March, the local school board voted to close Hamlin and send students to Pittston next fall. As the day began, some of the Hamlin students were shy, but the hope was that the event would gradually help those students adjust as they transition to their new school next fall. The decision to close T.C. Hamlin was a long time coming. District enrollment has steadily declined for nearly a decade. The tipping point came last fall. Superintendent Pat Hopkins said that’s when a lack of teachers forced Hamlin to send a class of students to nearby schools. She said a school nurse only visited Hamlin for a half-day every week. Teacher Leader Sara Hess said one teacher was forced to cover third, fourth and fifth grades — all at once. But some residents resisted the decision. Like a lot of rural schools, Hamlin is the center of its community. Without an elementary school, they wondered: would people want to move to town? And would they stay? Randolph resident Pete Coughlin spoke at a school board meeting earlier this year. Local officials have tried to assure residents that, for now, the school building isn’t going anywhere and will still be a service center. Yet, similar worries have prompted some towns to withdraw from regional school boards and form their own districts. In effect, putting control of local schools back into their own hands. But in many cases, communities have had to face financial and demographic realities. According to the Maine Department of Education, 91 public schools have closed in the state over the past 10 years. “We have to have as many resources as possible. We can’t just hold on to traditions and hold on to what things were, 20, 40, 60 years ago,” said Ben Sirois, the superintendent of School Administrative District 27 in Fort Kent. SAD 27 is in the very north of Maine, serving students from Fort Kent to the Allagash. The district closed three elementary schools in as many years after enrollment fell to a few dozen students per school. The hour-long bus rides have been hard, particularly for preschoolers. But Sirois believes consolidation has been largely positive for the region, that it’s led to more socialization and educational opportunities. The district is even in the running to construct a new regional high school that would serve students from the entire St. John Valley. Hess said she understands the benefits, but that it’s tough for students to say goodbye to their neighborhood school. But Hess sees signs that make her feel optimistic about the transition. As a few young girls got in line for the water gun station during the carnival event, a student from Pittston called them over and introduced them to her friend, and, soon, they were playing and cheering each other on. The possibility of even more school closings leave many rural towns facing questions of their identity over the next 10, 20 or 50 years. But on that day, the staff at Hamlin were feeling confident that, come next fall, their students will be OK.